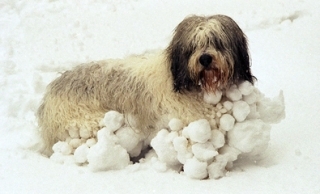 The only time I would recommend shaving a pet in the winter is if they are kept indoors at all times (in a climate controlled environment like the house – not a shed), and or they are extremely matted. If you are on a tight budget after the holidays get a bath and brush for your pet and stretch your groom a little longer. Don’t forget to brush at home too. If your pet is normally in the house then they need to stay in during the winter. They are not acclimated to colder temps and therefore have not had time to develop a winter coat to help protect them from the elements outside. If they are not in the house, consider bringing them in. We have seen record breaking cold temps this year in Texas and just like we are not used to it, our pets are not either. This entry was posted on Tuesday, January 12th, 2010 at 9:49 am	and is filed under Uncategorized. You can follow any responses to this entry through the RSS 2.0 feed. Responses are currently closed, but you can trackback from your own site.